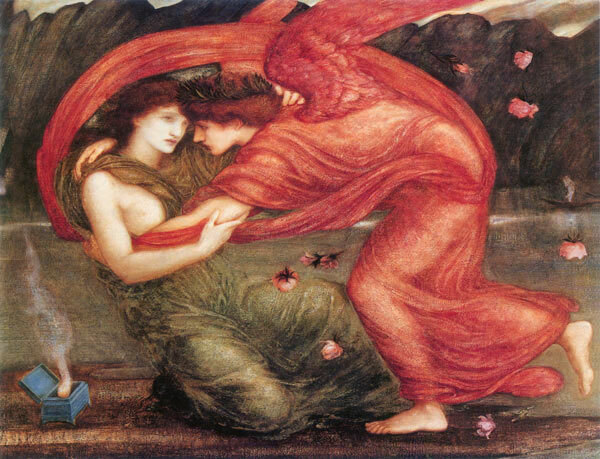 There are various versions of the myth of Psyche, the mortal woman, and Eros or Amour, the God of Love. For our purposes, we are going to overlook some of the jealous and conniving qualities given to Eros's mother, Aphrodite, once she became part of the Greek pantheon. (She could be compared to the evil queen in Snow White, who was jealous of the maiden's renowned beauty.) Instead, we are going to focus on Aphrodite's ancient origins as the Great Mother Goddess. Yes, she was a purveyor and partaker of love and beauty, but in our story, we see Aphrodite as a guiding force, who wants her potential daughter-in-law to learn some things for herself--not in a harsh, punishing way, but in a "this is good and necessary for your growth" kind of way. In other words, Psyche has to earn the love of Aphrodite's son, Eros, just as we, in life, must earn our stripes and the love and wholeness we each desire but must strive for. It has been said that as children we deserve and should be able to enjoy unconditional love, but as adults, we cannot expect it, meaning we cannot behave any old way and expect to be loved just for who we are in a self-absorbed kind of way, no matter how bad our behavior is or how poorly we treat others. We must learn to love responsibly and there are usually a number of pitfalls along the way. Psyche's journey is the heroine's journey we must all take to learn how to love (not only others, but ourselves) and to test our mettle so that we may evolve, achieve an inner union of opposites, and become whole. The story goes like this: Psyche is the youngest and most beautiful of three daughters. 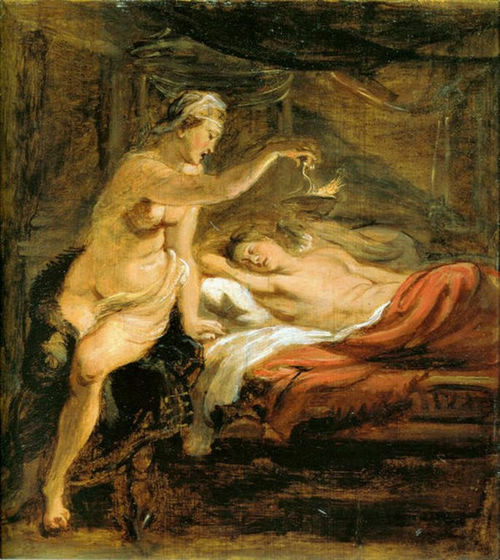 The older sisters are married off, but Psyche is not, for her loveliness is a bit off-putting and intimidating to suitors, as may be the case with certain young women who are rather self-possessed and may not yet recognize their own beauty and power. Her parents want to find a husband for her and when Aphrodite learn of this, she sends her son with his love-tipped arrows to make her fall in love with a monster. But, as such stories go, Eros pricks himself with the arrow, falls in love with Psyche, and carries her off to paradise. There, they live a rapturous existence as long as she does not ask to know him or to look upon his face. Psyche is content living this unconscious existence for a while until her sisters come to visit. In a fit of envy, they convince her to look upon the man she beds each night, suggesting he may be the very monster she was to marry. She must kill the serpent, they cajole. Psyche goes to her lover at night with a lantern in one hand and a knife in the other. When she shines the light upon his face, however, she is astonished to find not a monster, but the magnificent God of Love, himself. She accidentally touches the point of his arrow and falls deeply in love with him just as a drop of oil from the lamp falls upon him, awakening him. Horrified that she has broken her vow to not look upon him, he flies away on his great wings. Psyche is cast out of paradise and must find her way in the world, bereft that she has lost the love of her life and the chance to live in paradise. But isn't that the way of woman: to look and see what and who it is she is sleeping with? To want to know more? To shine the light of consciousness in relationship? To want to wake him up and not just follow his lead? To shake things up even if it is a threat to the status quo? Yup, that's the way of Woman. Psyche is not sure what to do, but she knows she must find this missing part--the masculine to her feminine. She must learn to go out into the world and accomplish things, not just wait passively for her fate, as she has thus far. And she must do it by calling forth all of her feminine power, but she is not yet sure what her powers are. Not to fear! Mighty Aphrodite is here! She gives Psyche a chance to win back her love, but first she must perform four tasks. If she can accomplish these she will be reunited with Eros. Psyche is unsure: These tasks seem impossible! The first is to sort a gigantic pile of seeds, which she must do before nightfall. Psyche weeps at the enormity of the task, but sets to work. She would not be able to finish the job in time but for an army of ants who march in to help her. Psyche accomplishes one of the most important roles of the feminine: to sort and cull, to make order out of chaos, to take something overwhelming and find her way through the demands of the world one kernel at a time. The next task requires Psyche to go to a field and collect a bit of golden fleece from the fierce rams corralled there. Psyche knows she could be bludgeoned to death by the rams' horns if she tries to gather the wool directly. She again weeps in despair, and the reeds that grow along the banks of the river hear her and whisper to her the secret to collecting the fleece unharmed. She must return at dusk when the rams are on the other side of the pasture and gather it from the branches of the bushes they rub against. This Psyche does without having to confront danger head on. This, too, is the feminine way. To figure out how to go about reaching a goal without engaging in conflict that might cause more harm than good. To look for peaceful, yet resourceful, resolution. 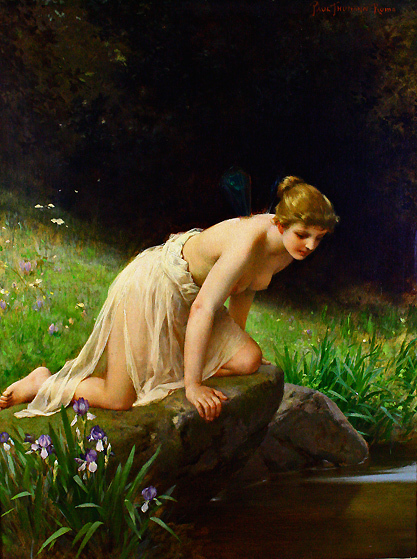 The third task Aphrodite sets for Psyche involves collecting water from the River Styx, the great river that one must cross into death, a river that is guarded by terrible monsters of all ilk. Once again, Psyche falls apart, but this time she does not cry because she has no tears left. She holds up the goblet she is to fill and an eagle (sent by Zeus, acting on Eros's behalf) swoops down, plucks the goblet from her hand, and carries it to the middle of the river. There, the cup is filled, and the eagle brings it back to Psyche. This is the role of the feminine, to see the big picture as the eagle from on high, to see what needs to be done, dive in and do it. This requires filling one cup at a time before moving on to the next. The fourth and final task is for Psyche to go down into the Underworld and ask Persephone, the maiden turned queen, for a box of her beauty, which she is to bring to Aphrodite. Psyche goes to a tower where she learns of a hidden doorway, which she takes into the bowels of the earth, where she must only eat the bread she brought with her lest she be bound to that place like Persephone when she ate the pomegranate seeds. Psyche must ignore the pleas and manipulations of others who seek to distract her and pull her off her path, and she must not remain in the darkness, for her journey is to return to the light, having obtained the cask Persephone bestowed upon her. Psyche is not to open the box, but like most women, curiosity gets the best of her and she opens it to find--nothing. Nothing but a heavy sleep comes over her and she falls deeper and deeper to near death, until Eros comes to her aid and pierces her with his arrow, bringing her back to life and union with love. With the aid of her helpers, inner guides, feminine wisdom and strength, Psyche is able to integrate her many parts and achieve immortality. As a goddess, she weds Eros, and gives birth to their daughter, Hedone, another word for bliss.